Contents and Media: One full-sized 14.5cm x 20.5cm decal sheet (both sets); plus 17.5cm x 13.5cm sheet and small errata sheet (Part One); plus 5.5cm x 14cm supplementary sheet (Part Two); one double sided, letter sized, full colour instruction sheet. 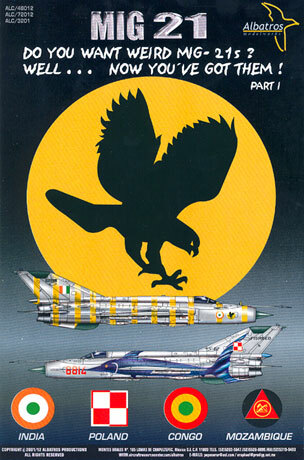 Albatros Productions' latest decal releases are Mig-21 Parts I and II. 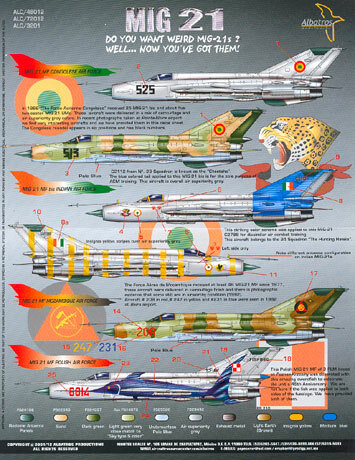 The cover sheets are adorned with the words "Do you want weird Mig-21s? Well... now you've got them!" I couldn't have put it better myself. Weird? certainly. Attractive? Oh, yes. The Mig-21 is a somewhat neglected subject considering the wide availability of the Academy kit in 1/48 scale and the Trumpeter kits in 1/32 scale. Admittedly, the Academy Mig-21MF looks more like a Mig-21 bis straight from the box (mainly due to the shape of the spine fairing), but there are several fixes available. Mozambique Mig-21MF in four colour camouflage with three aircraft number options in yellow, blue or red. 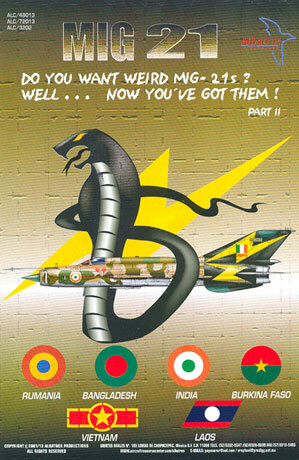 Indian Mig-21 bis in four colour camouflage with black rear fuselage and tail with four yellow lightning bolts superimposed. Laotian Mig-21MF in overall light grey. The decals on my 1/48 scale sample are in perfect register and display minimal carrier film. As always, the glossy instructions are real highlight. The notes are brief this time, and a little ambiguous in places, but the artwork is once again first-rate. Albatros Productions approach the decal business with a combination of quality and a real sense of fun. The markings on these new decal sheets reflect this approach. Some of these options will look breathtaking on plastic. Thanks to Eli from Albatros Productions for the review sample.